Colorado colleges may soon begin growing their own weed — that is, if a group of state officials have their way. In a letter sent to federal health and education officials last month, the state’s attorney general’s office asked for permission for Colorado’s colleges and universities to “obtain marijuana from non-federal government sources” for research purposes, the Los Angeles Times reported. They say the state’s legalization of pot has raised larger questions about the drug’s health affects, which could be studied to “fill the void of scientific research” at universities. “Current research is riddled with bias or insufficiencies and often conflict with one another,” Colorado Deputy Attorney General David Blake wrote in the letter, which was sent to five federal agencies including the Department of Health and Human Services, the Department of Education and the National Institutes of Health. Only one federally approved marijuana farm exists at the University of Mississippi’s National Center for Natural Products Research, which is operated by the National Institute of Drug Abuse, according to the Brush News-Tribune. But bureaucratic red tape make it difficult for researchers to obtain the pot, so Colorado officials would instead like universities to contract with NIDA to grow their own weed locally. While marijuana is legal in Colorado, save for some qualifications, it remains illegal under federal law, and the state is still struggling to regulate marijuana products like edibles and stay ahead of potential health threats that increased consumption of the drug may cause. 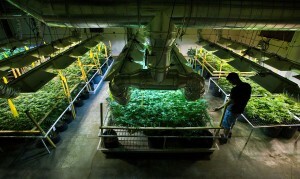 Left: Ryan Milligan tends to the plants he grows at the Greenwekrs facility for sale to medical marijuana dispensaries in Denvery, Colorado, on August 3, 2011. Photo by Randall Benton/Getty Images.